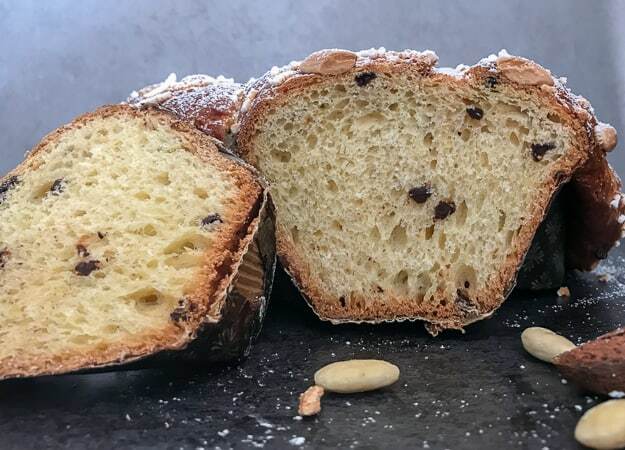 Colomba Italian Easter Dove Bread, a delicious sweet yeast bread, bake it with your favourite fillings, chocolate chips, candied fruit, raisins or even plain. The Perfect Sweet Bread for Easter Breakfast, Brunch or even Dessert. You know it’s almost Easter in Italy when every grocery store you go to is filled with every type of La Colomba Italian Easter Dove Bread. La Colomba is a delicious sweet bread made with yeast. In English Colomba means Dove. While Pandora or Panettone is the traditional Cake/Bread for an Italian Christmas, then Colomba is the traditional bread for Easter. To make the Classic Colomba you have to start with a starter dough. This is a yeast dough that is not as complicated as it looks, you just need patience and time. In a medium bowl add tepid water and yeast, let sit 3-5 minutes then stir to combine. Slowly drizzle in some of the flour, mix to combine until it forms a ball (it will be quite sticky), then place the dough in a clean bowl, cover with plastic wrap and a clean kitchen towel, place in a warm draft free area and let it rise for one hour. Move the dough to a lightly floured flat surface, (keep surface lightly floured at all times, because dough is quite sticky). 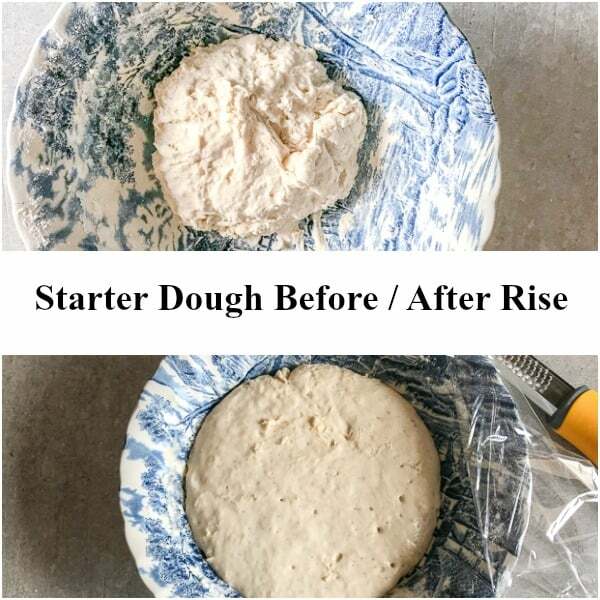 Spread the dough then add the risen starter dough, knead to combine (approximately 5 minutes), place in a large clean bowl, cover with plastic and let rise in a warm draft free location for 1 hour. Place dough on lightly floured surface and knead in 3 1/2 tablespoons butter softened (50 grams), approximately 3 minutes (there may be spots of butter throughout the dough). Place in a clean bowl, cover with plastic and a clean kitchen t towel, let rise in a warm draft free location for 4 hours. Place dough on lightly floured surface and knead in 2 1/2 tablespoons butter softened (30 grams), chocolate chips (or candied fruit or raisins if using) approximately 3 minutes (there may be spots of butter throughout the dough). 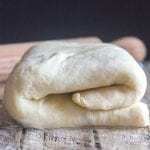 Place dough in an un-greased and un-floured dove pan or cake pan (9 or 10″ / 22-25 centimeters), cover with plastic and a clean kitchen t towel, let rise in a warm draft free location for 3 hours. In a small bowl beat together until thick, egg white and powdered/icing sugar, coat top of final risen dough, sprinkle with whole almonds and pearl / nib sugar. Bake in 350° (180° celsius) Pre-heated oven for approximately 45-60 minutes or until toothpick (I used a wooden kabob stick) comes out clean and dry. Let cool before serving. 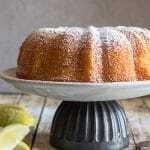 If you can’t find pearl / nib sugar then I have a recipe for Homemade Pearl Sugar on my Ciambella Romagnola Italian Cake. Can the Colomba / Dove Bread be made in a Stand up Mixer? Yes if you don’t want to or can’t knead the dough by hand then yes just make sure to use the dough hook of the mixer and cut the knead time by a little less than half. 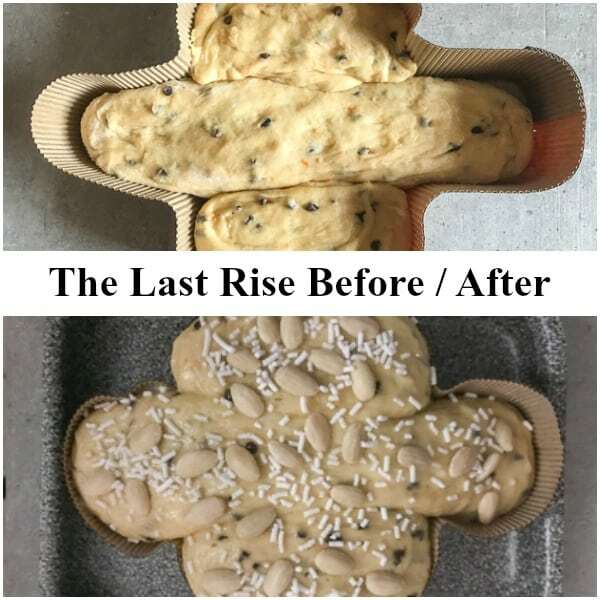 Last Easter I made a delicious Easter Bread that was always baked and shared at Easter time when I was a kid by my sister’s late mother-in-law. And now since I am having so much fun baking with yeast, I just had to try La Colomba this Easter. Which I am remaking again this Easter. 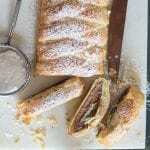 What can you use as a filling for Italian Easter Bread? Usually these Italian sweet breads are filled with candied fruit or raisins, and since a few members of my family don’t like candied fruit and the other couple don’t like raisins, chocolate chips won. In Italy you can purchase these delicious sweet breads with chopped chocolate or chips and also covered with melted chocolate! Which I have to say is one of my favourites! I know I have said it before and I will continue to say it, do not be afraid to bake with yeast. I never used to make Sweet Doughs with yeast because I was convinced it was difficult and would taste yeasty. But believe me it isn’t and it doesn’t. 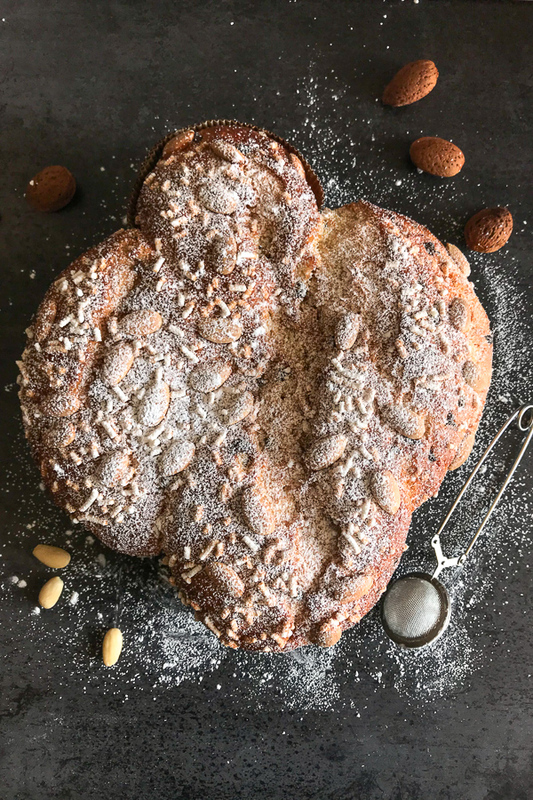 I started with a simple Brioche and now I have tackled this amazing Colomba Italian Easter Dove Bread. Whether you have tried this delicious sweet bread before or not then I think you should try making it yourself. Surprise everyone at Easter with An Italian Easter Bread. Remember all you need is time and patience. It just might become your new Easter tradition. Enjoy! 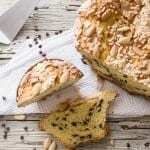 Colomba Italian Easter Dove Bread, a traditional Easter Holiday Italian Sweet Bread, a perfect dessert or snack treat recipe. In a medium bowl add tepid water and yeast, let sit 3-5 minutes then stir to combine. Slowly sprinkle in the 1 cup + 1 tablespoon of flour, mixing to combine until mixture forms a ball (will be quite sticky), place in a clean bowl, cover with plastic wrap and a clean kitchen t towel, place in a warm draft free location and let rise 1 hour. In a large bowl mix together flour (2 3/4 cups + 2 tablespoons), sugar, egg yolks, 1/4 cup + 3 tablespoons butter softened (100 grams), vanilla, zest and salt, add the milk a little at a time, mixing until dough is soft and elastic, move to a lightly floured flat surface, (keep surface lightly floured at all times, because dough is quite sticky) spread dough and add risen Starter dough, knead to combine (approximately 5 minutes or 3 minutes with a stand up mixer), place in a large clean bowl, cover with plastic and let rise in a warm draft free location for 1 hour. 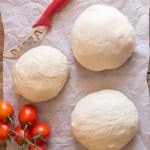 Place dough on lightly floured surface and knead in 3 1/2 tablespoons butter softened (50 grams), approximately 3 minutes (or approximately 2 minutes with a stand up mixer), there may be spots of butter throughout the dough. Place in a clean bowl, cover with plastic and a clean kitchen t towel, let rise in a warm draft free location for 4 hours. 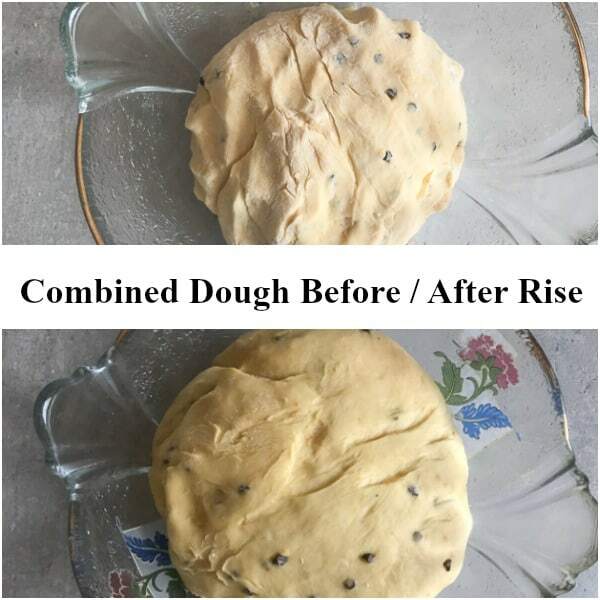 Place dough on lightly floured surface and knead in 2 1/2 tablespoons butter softened (30 grams), chocolate chips (or candied fruit or raisins if using) approximately 3 minutes (or approximately 2 minutes with a stand up mixer) (there may be spots of butter throughout the dough). Place dough in an un-greased and un-floured dove pan or cake pan (9 or 10" / 22-25 cm), cover with plastic and a clean kitchen t towel, let rise in a warm draft free location for 3 hours. Bake in 350° (180° celsius) Pre-heated oven for approximately 45-60 minutes or until toothpick (I used a wooden kabob stick) comes out clean and dry. Let cool before serving. Enjoy! Dough can also be kneaded in a stand up mixer using the dough hook. Updated from March 3, 2018. Thank you for posting this recipe! 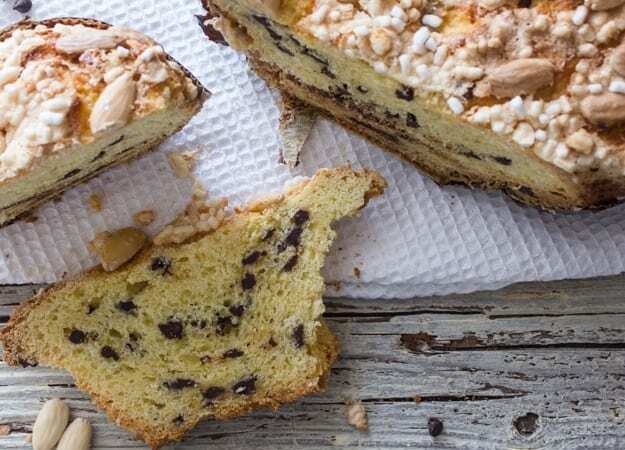 I’ve always enjoyed the traditional Colomba at Easter growing up in an Italian family and this will be my first attempt at making it. Very detailed instructions, thank you! One suggestion would be to update the prep time at the top of your recipe to 9 hours as the process and rest time before cooking appears to come to 9 hours. I just find this helpful when I’m planning the preparation schedule for large holiday meals. Great job and thanks again for sharing! 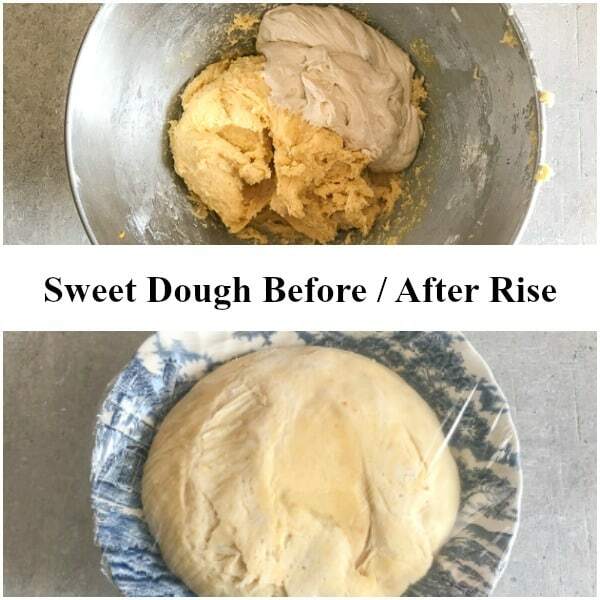 Hi Kristine thanks so much and yes I just updated the recipe to show the time for the rising of the dough. Have a wonderful Easter. I’ve made easter breads before but I am going to try yours…..I use my kitchen aid with the dough hook attachment. I am a little confused on how to do that with this recipe. I have always made the starter and let it ferment. Then I add the dough to the starter and mix with the dough hook adding the fruit and zest once combined…..then let it rise until doubled…..then shape and let rise again until ready to bake. The kneading in the butter in intervals is what confuses me. Does that mean I keep returning it to the kitchen aid every time?? Hi Lorraine, I started with a hook attachment (but it can be done all by hand) and I also combined the starter and sweet dough (first rise) with the dough hook, the two times I added the butter (and chips or candied fruit) I kneaded it by hand, the butter is soft so it combine without a problem. Hope that helps. Have a great weekend. Ohhhh, I am very familiar with La Colomba! When I lived in Sardegna, a friend told me I had to have it! I went and picked one up. I think I ate nearly the entire thing in one sitting! Earlier this week, I bought one from a local chocolate factory. SO fresh and delicious. I’m happy to see this recipe — now I can enjoy them all year. Yikes! Hi Bridget, I know what you mean! One of my favourite Italian sweets. Enjoy! I love baking with yeast Rosemary, and this is such a lovely authentic recipe! My boys will appreciate the chocolate chips as they are not candied fruit fans either. Thanks for sharing this just in time for Easter! This is new to me, but looks delicious. I think I’ll just need you to send me one, because I’m afraid I don’t have the patience for yeast breads. Renee, you need to try a yeast bread and then you will be hooked. But ok I will bring you one!